The Lever House sits on the corner of Park Ave and East 53 just opposite Seagram building(read about Seagram in my blog). The building was constructed in 1952 as the new headquarters for the Lever Brothers Company, the manufacturers of soap and detergents. It was the first glass-walled building on Park Avenue and soon became standard for modern office buildings in the United States. The building was also the first fully climate-controlled, fixed-windowed office building in NYC. 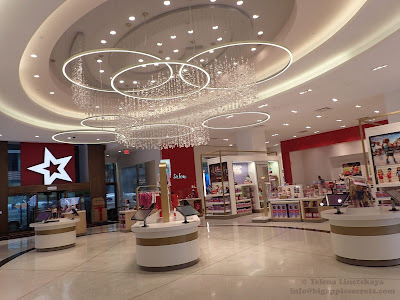 The leading architect of the building Gordon Brunshaft based the design on the ideas of European modernist architects such as pioneer of modern style Le Corbusier and Seagram architect Mies van der Rohe. 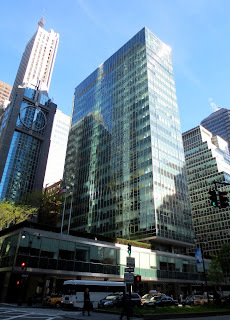 Lever House was designated an official landmark in 1992. The building was renovated in 1998. There is restaurant Casa Lever on the ground floor and a bar that is always crowded on summer nights . The building's plaza and lobby are used as a gallery now- only 25 percent of the lot is used for the tower. A year ago “Art History With Labor: Ninety Five Theses” exhibition by the Bruce High Quality Foundation (BHF) opened in the lobby, reimaging Martin Luther’s 95 Theses for the modern age. In 1517 a German monk Martin Luther wrote to Albert of Mainz, Cardinal of Hohenzollern, protesting against the sale of indulgences. He enclosed in his letter a copy of his "Disputation of Martin Luther on the Power and Efficacy of Indulgences," known as The Ninety-Five Theses. The art show consisted of real objects including a bucket with a mop, a wheelbarrow with a bag of soil, a floor polisher, and other elements that made the lobby look like a construction site. Each object was equipped with a speaker pronouncing the theses. Free for the taking there were four pages, mimicking Martin Luther’s 1517 document, with quotes from Luther, Oscar Wilde, Jean-Paul Sartre, Thomas Edison, in addition to facts about Ayn Rand, Nikola Tesla, Paul Robeson and the Lever Brothers, who built the company. 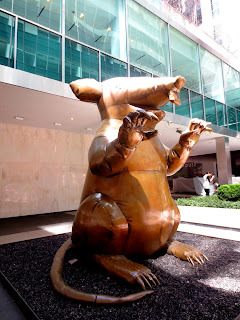 The giant bronze rat was the part of the show. It was named “The New Colossus”. The name of the statue is the same as the title of a sonnet by American poet Emma Lazarus. In 1903, the poem was engraved on a bronze plaque and mounted inside the lower level of the pedestal of the Statue of Liberty. The original model for the sculpture is the huge vinyl blow-up Scabby The Rat, usually located on the street outside to mark the protest of union workers. Scabby made his first appearance at a union protest in Chicago in 1990. 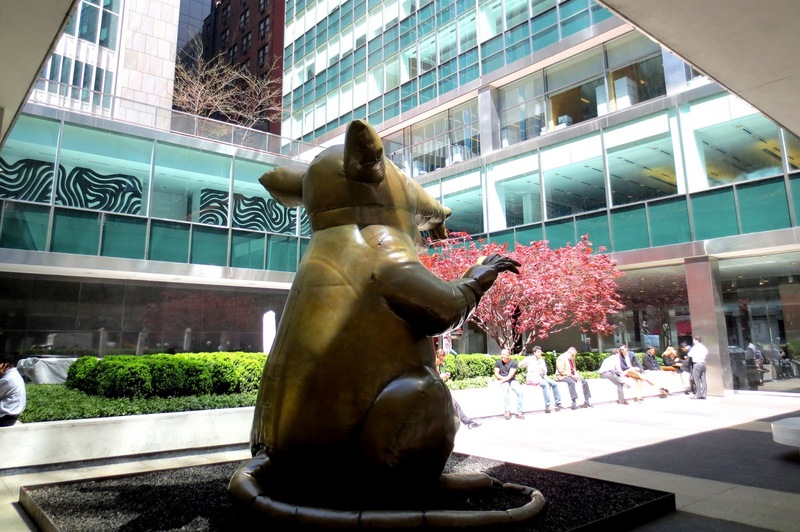 The masons union was reportedly the first New York union to use the rat. There is a new art show in the lobby now but the rat is still there.